Of those, only the first one is a serious contender for inclusion into the boxes. It’s wonderful. I made the walnut paste myself, toasting the walnuts in a 300 degree oven. I then made a batch of caramel, melting sugar and heating it to a rich amber shade. Once the caramel was cool, I ground the walnuts and caramel together in a food processor for about twenty minutes, until the walnuts became a smooth paste with tiny crispy-crunchy bits from the caramel. Then I mixed in dark chocolate, tempered it, and poured it into a frame to set. Once the gianduja was set, I steeped cinnamon in boiling cream and strained it into a bowl of chopped milk chocolate. I waited a little for the cream to melt the chocolate, then stirred it all together into a nice smooth pudding-like ganache. Added some butter, and poured it into the frame on top of the gianduja. After the top layer set, I cut it into squares with my confectionery guitar and dipped them in dark chocolate. Lovely! What I love about this particular flavor is the variety in textures. I had intended to grind the caramel-walnut paste completely smooth, but the caramel wouldn’t cooperate, so I wound up with tiny crunchy bits. This actually turned out to be a bonus! as it added textural interest to the ganache and also a little burst of caramel flavor towards the end of the chocolate. The cinnamon complemented the walnut-caramel flavor without overwhelming it. It is still not a 100% certainty to go into the boxes (this year’s lineup is particularly strong), but it’s a very serious contender. Also in contention is the cinnamon milk chocolate ganache. I made it with Ceylon cinnamon, which is sweeter, more complex, and not as “hot” as cassia cinnamon (which is what is usually sold as cinnamon in the U.S.). 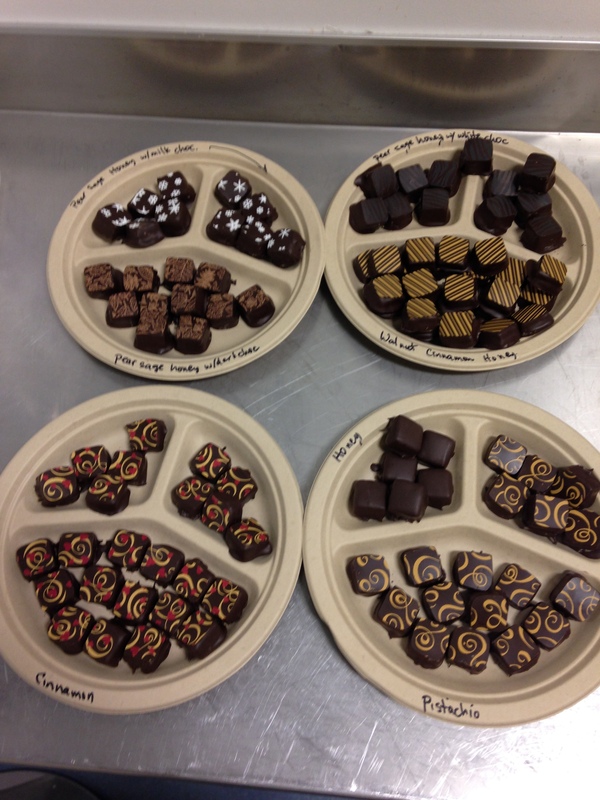 The result was a great milk chocolate bonbon with a strong-but-not-overpowering cinnamon flavor. The wonderful part is that the cinnamon flavor unfolds over a period of about a minute, changing overtones the entire time. I’m not as in love with it as with the walnut, but it’s really, really good. A candidate for second-string inclusion. The pear-sage -honey variants were a bit of a disappointment. I had made some pear-sage-honey jam earlier in the year – lovely! – and had been hoping to capture the magic in chocolate. Unfortunately, pears have a fairly delicate flavor, and the chocolate tended to overwhelm it. The sage wasn’t really detectable, nor was the honey. Probably the most successful variant was pear and white chocolate, which came out as a very nice vanilla-pear combination. Still not inspired, though, so I counted it a failure. The remaining two flavors were batch failures – meaning they had serious technical issues that would require redoing the test. The pistachio/white chocolate gianduja came out too dense to cut easily, and the kaffir lime/lemongrass/ginger/coconut milk caramels came out too soft to cut. I tested both flavors by dipping a piece into melted chocolate and taste-testing; neither was particularly interesting, so I abandoned the experiment. One thingÂ I discovered along the way is that it is quite possible to repair a separated ganache. Every once in awhile, one of my ganache centers will curdle, and in the past I’ve had a lot of trouble getting it back to a smooth consistency. 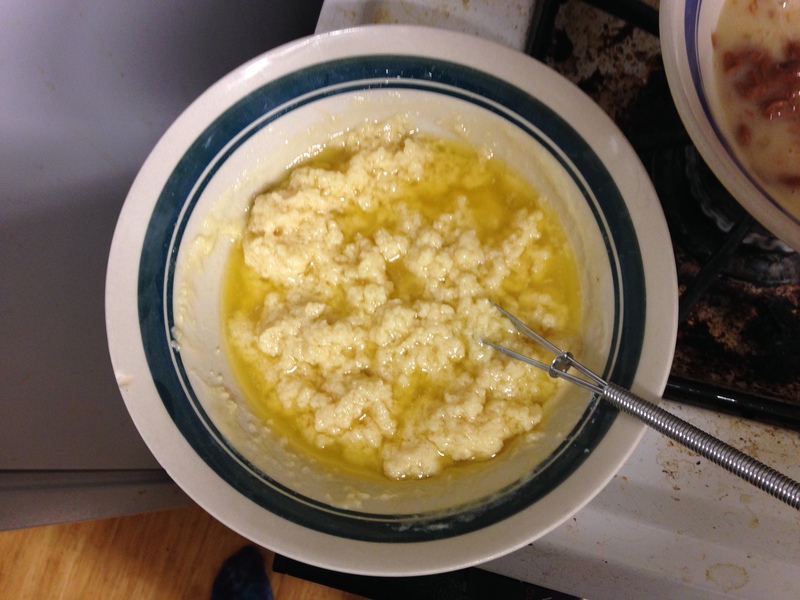 In fact, in the past I’ve typically just thrown the curdled batch out. But this year I tried something different. One of my newer chocolate books (I think it’s Chocolates and Confections by Peter Greweling) discussed the problem of separated ganaches, and asserted that it was typically a temperature problem, rather than a problem with the ratio of ingredients (which was my assumption). The author said that ganache needed to be at 90-94 degrees in order to mix up properly, and if it wasn’t in that range it would likely separate. But to pull it back together, all you had to do was heat/cool it to the correct temperature and stir it up again. 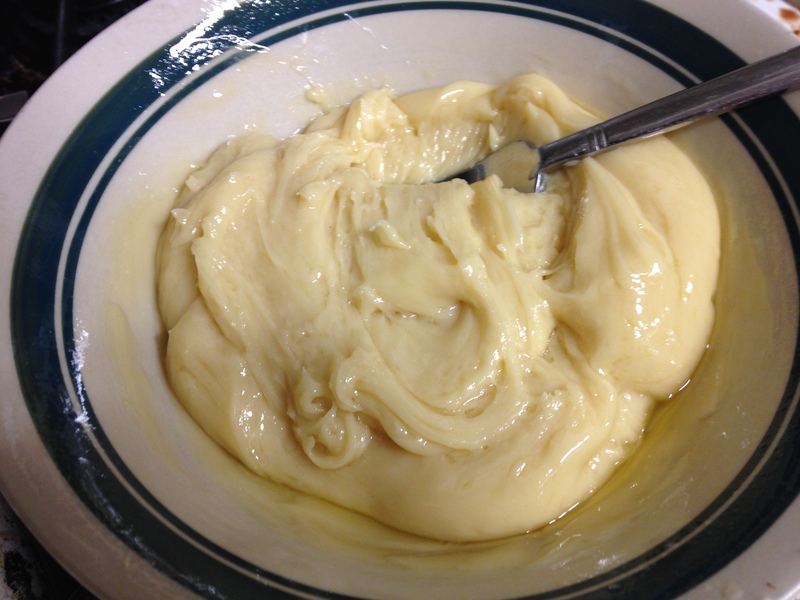 So when the white chocolate ganache curdled on me, I tried the new method. And it works! This probably doesn’t seem that impressive to you, but for me it was nothing short of amazing! A solution to a problem that has dogged me for years. These are mostly flavor combinations from Jean-Pierre Wybauw’s Fine Chocolates 4 – which I have now read, and which is every bit as excellent as the first three books in the series. If you are serious about chocolate work, it’s a must-have. Book-wise, I realized (with help from a friend) that the chapter I’ve been writing has a major structural problem. Back to the word processor for a major revision. I haven’t quite had the nerve to start rewriting yet, but I’ll probably start again tomorrow morning. I’m also thinking that it’s time to start interviewing people again. I now have a pretty good idea of how I’m going to include interview content in the book, and while I have a lot of good material already, I’d like to include some additional crafts – ceramics, basketweaving, glasswork, etc. I am not sure how I will juggle the interviews with chocolate season, but I want to get them done before the holidays, so they need to be done soon. What’s interesting about this photo is that it shows their relative sizes really well. Fritz is a big boy – he weighs almost 50% more than Tigress (12 lbs vs. 8.5), who is more delicate-boned. It’s not obvious most of the time because they’re usually in motion! 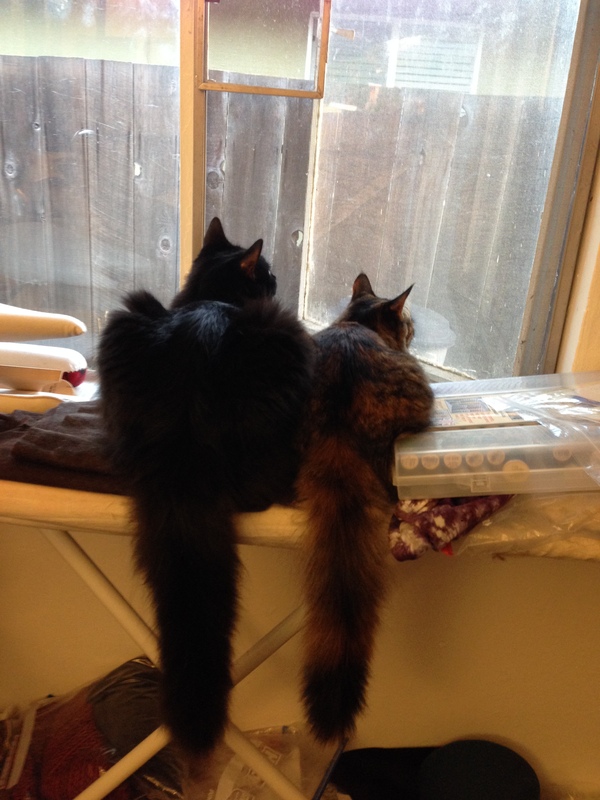 But side by side, in identical poses, it’s pretty obvious that Fritz is much bigger.